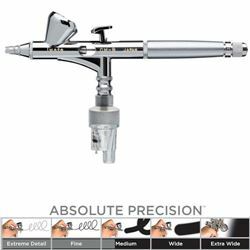 Experienced airbrush users who demand absolute precision choose Iwata Custom Micron Series airbrushes for extreme detail spraying. What makes Custom Micron special is that every head system is custom matched and hand-tuned to meet Iwata's rigorous performance standards for superior atomization. Replacement Head Systems are tested and tuned to the same standards to ensure that Custom Micron will maintain its precision over time.